Create a designated area for your child to study with the Mainstays Student Desk. It's made of sturdy wood and composite. This bedroom student desk comes in a variety of finishes to complement existing decor. It features a large work surface and an attached space that features a single drawer and two open shelves. Pair it with a task chair (sold separately) of your choice for a completed look. The easy-glide accessory drawer opens and closes effortlessly. Your child can use it to store pens, pencils, notebooks and other supplies to keep them close at hand. The two shelves are well-suited for displaying decorative items like pictures and holding books and other accessories. 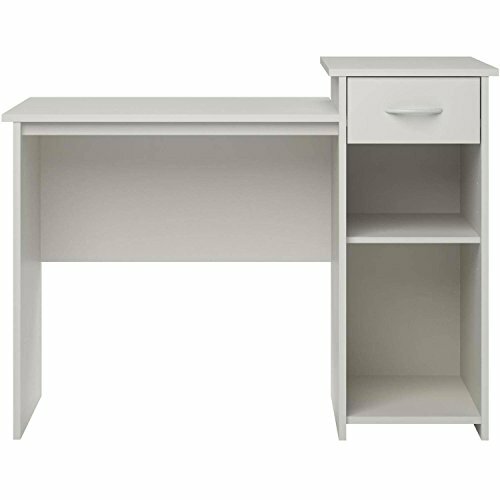 This Mainstays Student Desk is ideal for placing in a bedroom, a home office or a dorm. It also requires some assembly. If you have any questions about this product by Mainstay, contact us by completing and submitting the form below. If you are looking for a specif part number, please include it with your message.